Year after year, we see the arrival of new metal bands. After the "reformation wave", the new fashion seems to be the "dream team" band. After Virgo, here comes Taraxacum (what the hell of a name is it for a metal band !!!). With Rick Mythiasin (Steel Prophet's vocalist) and Tobias Exxel (Edguy's bassist) without forgetting Franky Wolf (ex-Squealer) and Ferdy Doernberg, we can say that Taraxacum is full of strong musicians. Rick told me "It sounds a bit like Journey, but it will be more heavy". I agree on that picture, even though Taraxacum reminds me also sometimes Van Halen. Rick sings again like a monster. Hey man, you have been touched by the Gods !!! 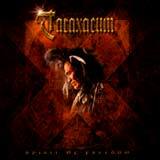 The music is ok and between Journey or Van Halen, Taraxacum delivers some rockets : Circle Of Fool or Life Goes On. The opener Spirit Of Freedom is also excellent, but let's face the truth : this album has been written by excellent musicians and produced by excellent sound producer (Kai Hansen/Dirk Schlächter please !!!) and the overall is a bit too predictable. Where is the magic ? Why Taraxacum didn't took much more risks ? Fear ? Fear of what !!! We knew from the beginning it will never sound like Edguy or Steel Prophet. So why have you chosen the easy path guys ??? For a first shot, I expected a bit more than Journey meets Van Halen.